You can use System Center Configuration Manager (SCCM) to deploy the new OneDrive sync client (OneDrive.exe), as well as the mobile apps for iOS and Android. Before you begin deploying, make sure you have reviewed the planning information and deployment options in the OneDrive guide for enterprises. The new OneDrive sync client can be used with SharePoint Server 2019, but not earlier versions of SharePoint Server. For more information about the restrictions and limitations of the OneDrive sync client, see Invalid file names and file types in OneDrive, OneDrive for Business, and SharePoint. If your users are currently using the OneDrive for Business sync client (Groove.exe), and you want to move them to the OneDrive sync client, see Transition from the previous OneDrive for Business sync client before proceeding. If the computers in your organization are running Windows 10, they already have the new sync client installed. If the computers have Office 2016 or Office 2013 (Home & Student, Home & Business, Professional, Personal, Home, or University) installed, they might also have the new sync client. Office is installed per machine, whereas OneDrive needs to be installed per user. If you plan on deploying Office to your organization, you will need to deploy OneDrive.exe separately for additional users on individual machines. To set registry keys on computers in your domain, install OneDrive and copy the OneDrive.admx and OneDrive.adml files from %localappdata%\Microsoft\OneDrive\BuildNumber\adm\ to your Group Policy central store. For more info, see Use Group Policy to control OneDrive sync client settings. In System Center Configuration Manager, select Create Device Collection and follow the steps in the Create Device Collection Wizard. Save the OneDriveSetup.exe installer for Windows to your local computer or a network share. Download the Production ring OneDriveSetup.exe installer for Windows or download the Enterprise ring OneDriveSetup.exe installer for Windows. Download the sample SCCM package. It's a .zip file that contains the script installer deployment type. For more information about packages and programs in System Center Configuration Manager, see Packages and programs in System Center Configuration Manager. The script installer deployment type already has a detection method script and will correctly assess the installation. Also, there is an uninstall switch, which means that you can easily remove the OneDrive sync client, if necessary. Copy the installer to a folder in the SCCM source content share. In SCCM, select the Software Library workspace. Under Application Management, right-click Applications, and then select Import Application. Select the Deployment Types tab on the bottom of SCCM, right-click the deployment, and edit the properties to update the Content location. Right-click the package, select Deploy, and follow the steps in the Deploy Software Wizard. (where pathToExecutable is a location on the local computer or an accessible network share). This command must be run at user logon and using Administrator permissions. It must be run for each user on a machine. For an example of how to deploy an .exe on every user account, see How to deploy the OneDrive sync client with SCCM. If you run the command with no command line parameter, users will see the installation status. After installation, OneDriveSetup.exe will automatically execute OneDrive.exe and display OneDrive Setup to users. If you run the command with the /silent parameter, OneDrive.exe will be installed transparently and OneDrive Setup won't appear. You'll need to run OneDrive.exe with an additional command. If you want to control the launch of OneDrive across your organization, we recommend using the /silent parameter. Learn more about application management in Configuration Manager. The installer will install the OneDrive executable file under %localappdata%\Microsoft\OneDrive. The new OneDrive sync client for Windows now supports syncing IRM-protected SharePoint document libraries and OneDrive locations. To create a seamless IRM sync experience for your users, deploy to your users' computers the latest Rights Management Service (RMS) client from the Microsoft Download Center. Even if these computers have the Azure Information Protection client installed, which includes the RMS client, the OneDrive sync client still needs a separate installation of the RMS client from the Microsoft Download Center. You can have the setup file on a network share and use managed software deployment to run the msiexec command. The sync client does not support IRM policies that expire document access rights. Use the following URL to start OneDrive Setup on users' computers. When users click to begin Setup, a sign-in window will appear for users can enter email address. Use the following URL with each user's email address to start Setup and prepopulate user email addresses in the sign-in window. If you want to auto-configure a SharePoint site to be synced, you can use the URL below as a guide to build the path to the SharePoint site you want to sync automatically. Replace HERE with the correct values for each component of the URL. Replace special characters like the period (. ), hyphen (-), and at sign (@) with the corresponding encoded values. For example, if the URL includes a hyphen, replace the hyphen with its encoded value, %2D. Additionally, you will need Client Side Object Model (CSOM) knowledge to query the team site to determine the appropriate SiteID, WebID and ListID to build the appropriate URL. When you use System Center Configuration Manager, make sure you run OneDrive.exe with User permissions (not as an Administrator). For help finding your tenant ID, see Find your Office 365 tenant ID. You can use System Center Configuration Manager to deploy apps to mobile devices. Before you do, however, you need to complete a few prerequisite steps because integration with Intune is required to manage mobile devices in System Center Configuration Manager. For information about managing mobile devices with System Center Configuration Manager and Intune, see Manage Mobile Devices with Configuration Manager and Microsoft Intune. 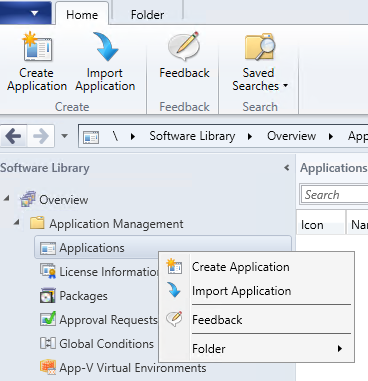 In SCCM, on the Home ribbon, select Create Application. In the Type box, select App Package for iOS from App Store. In the Location box, enter the app store URL, https://itunes.apple.com/us/app/onedrive/id823766827?mt=12. Target the app to users. 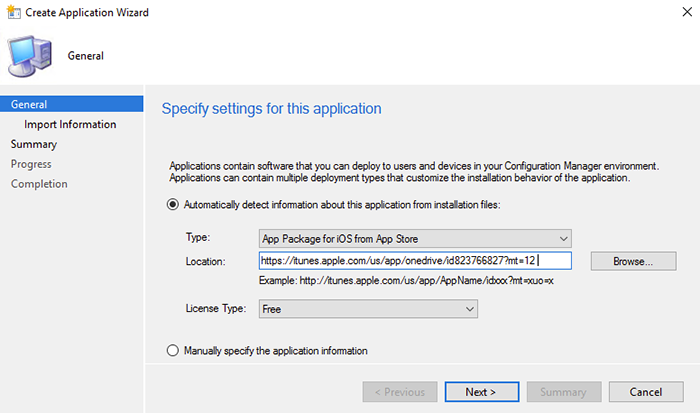 For more info, see Create iOS applications with System Center Configuration Manager, and use as the app location, as shown below. In the Type box, select App Package for Android on Google Play. 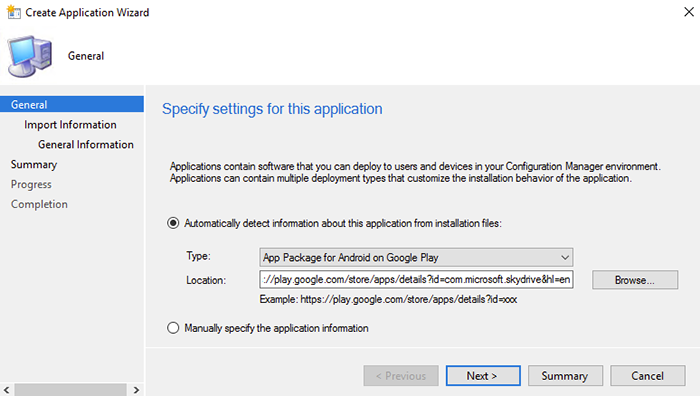 For more info, see Create Android applications with System Center Configuration Manager.